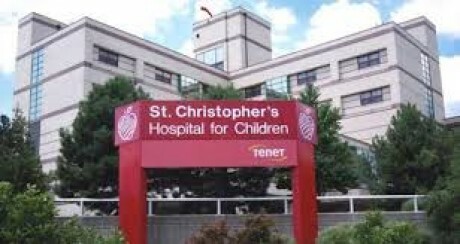 St. Christopher’s Hospital for Children, located at 160 East Erie Avenue in Philadelphia, is pleased to announce that it has been recognized as a 2013 Top Performer on Key Quality Measures® for children’s asthma by The Joint Commission, the leading accreditor of health care organizations in the United States. St. Christopher’s is the only hospital in Pennsylvania to receive this particular recognition for 2013. St. Christopher’s was recognized as part of The Joint Commission’s 2014 annual report “America’s Hospitals: Improving Quality and Safety,” for attaining and sustaining excellence in accountability measure performance for asthma in 2013. The hospital is one of 1,224 hospitals in the United States to achieve the 2013 Top Performer distinction and one of 20 pediatric hospitals in the country receiving for asthma. This is the third year that St. Christopher’s has been recognized as a Top Performer; the hospital was also recognized in 2012 and 2013 (in 2012 with the 2011 award; in 2013 with the 2012 award) for its performance on accountability measure data for children’s asthma. St. Christopher’s is one of only of 712 hospitals to achieve the Top Performer distinction for the past two consecutive years. Through St. Christopher’s A-HA Clinic (After Hospital Asthma), specialists at St. Christopher’s work to improve better asthma management and education, increase post-hospital follow-up visits, and decrease re-admissions and repeat visits to the emergency room for asthma. · Having at least one core measure set that had a composite rate of 95 percent or above, and (within that measure set) all applicable individual accountability measures had a performance rate of 95 percent or above. Accountability measures address compliance with administration of asthma medications during the hospital stay, and with assuring patients receive a home management plan of care at the time of discharge. In 2012 and 2013, St. Christopher’s Hospital sustained 100% performance on asthma medication management. The plan of care increased from 96.3% in 2012 to 98.7% in 2013. For more information about the Top Performer program, visit https://www.jointcommission.org/accreditation/top_performers.aspx. St. Christopher’s is a 189-bed hospital that is committed to delivering high quality patient-centered care to children throughout the greater Delaware Valley. Its highly acclaimed programs include a Level I Pediatric Trauma Center, Level IV NICU, a Heart Center and Oncology unit. Hospital services also include the only dedicated pediatric burn center in the region. St. Christopher’s achieved Magnet status in 2009 and numerous awards to St. Christopher’s physicians, who are frequently recognized in regional and national publications as “Top Docs” in their fields of expertise. St. Christopher’s recently opened the Center for the Urban Child, which provides children with comprehensive services to help break the cycles of food insecurity, violence and childhood illness. Construction is currently underway for another facility – the Critical Care Tower, opening in 2015. The Critical Care Tower will feature advanced technology while incorporating families’ needs and will house 50 critical care and 60 Level IV NICU beds. To learn more about St. Christopher’s, visit www.stchristophershospital.com or call 215-427-5000 or 1-888-CHRISKIDS (247-4754). Find us on social media at facebook.com/stchrishospital, stchrishospital.blogspot.com, youtube.com/stchrisvideos, pinterest.com/stchrishospital, and on instagram at @stchrismarketing and twitter at @stchrishospital.